AdultOne ticket covers up to 4 people. Your Carriage Awaits! Sit back, relax and experience Philadelphia's history and other popular Philadelphia attractions aboard one of these stylish coaches. Ride through Independence National Historical Park. Historical tales, cultural highlights and entertaining stories. 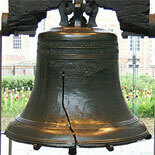 Allow Philadelphia's Premier Tour Company to show you the sights and tell you the tales of a city that forged a nation, cheered for Rocky, invented the soft pretzel and is home to the Liberty Bell and Independence Hall! Sit back, relax and experience Philadelphia's history and other popular Philadelphia attractions aboard one of these stylish coaches. Highly trained staff will enlighten and entertain you with historical tales, cultural highlights and entertaining stories of the city's past, present and future while you enjoy one of the majestic horse drawn carriage tours. 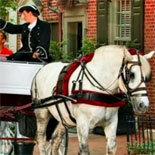 Journey back in time on an enchanting carriage ride through the tree-lined streets of Philadelphia's Independence National Historic Park, the nation's most historic square mile. Your private coach is driven by a very knowledgeable guide who provides expert personalized attention. Stately draft horses and certified drivers make this tour a family favorite by day. 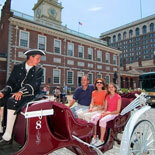 Enjoy Philadelphia attractions aboard one of the stylish coaches for a wonderful experience. 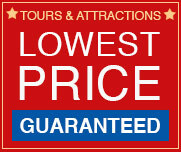 Tours are available during the day from 10:30am - 2:30pm daily. Closed Christmas Day and New Year's Day. Reservations are NOT needed or accepted. 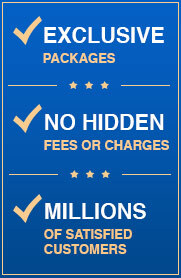 Tickets can be used on any operating day within 6 months of the purchase date. This is a walk up reservation based on availability. Exchange your eTicket at The Carriage Stand at 5th & Chestnut Streets across from Independence Hall or see our sales representative located at 5th & Market Street. Bourse Parking - between 4th and Ranstead Street. There are no age restrictions or requirements. Maximum occupancy per carriage is 6 passengers. All tours subject to availability weather permitting.